Update your living room with this modern swivel chair. Elegant and up-to-date, this chair features plush cushions, a versatile swivel base feature, and sleek track arms. The gentle curve of the shaped chair back offers cool contemporary views from any angle. The 1191 Modern Swivel Chair with Track Arms by McCreary Modern at AHFA in the area. Product availability may vary. Contact us for the most current availability on this product. Arm Wide contemporary track arm. Create a comfortable contemporary living space in your home with this high quality upholstered living room group. Clean modern lines create a no-fuss style that will fit your lifestyle. Comfortable, well-built, and timeless, these American-made pieces will be long lasting favorites in your home. 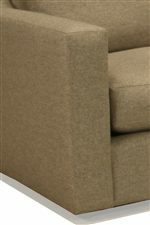 The 1191 collection is a great option if you are looking for Contemporary furniture in the area.